Preheat the oven to 350 degrees. Toast the walnuts for 7 to 10 minutes. Remove from the oven, let cool, and then coarsely chop. Combine with the honey in a small bowl. Halve the dates lengthwise, remove the pits, and stuff with the walnut mixture. In a small bowl, combine the vinegar, shallot, salt, and pepper, and mix well. Slowly whisk in the olive oil, stirring until emulsified. Gently toss 2 tablespoons or so of the vinaigrette with the greens. Divide the greens among 6 plates, placing them in the center. Cut each variety of cheese into 6 pieces. 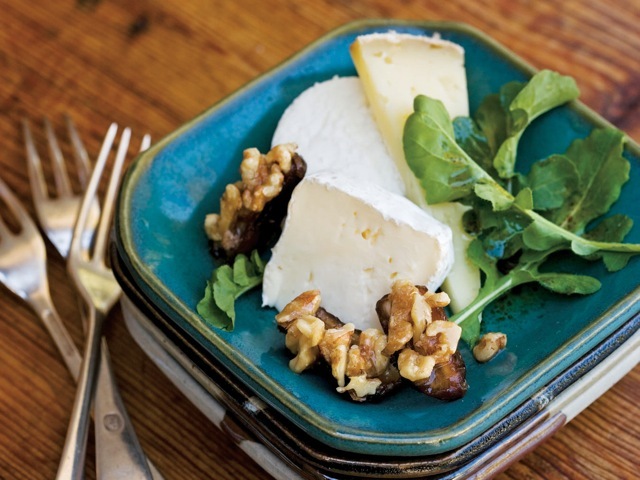 Place a piece of each kind of cheese and 4 date halves around the edge of every plate. Drizzle a few drops of the remaining vinaigrette over the goat cheese and serve.